Soccer fans get ready to score! 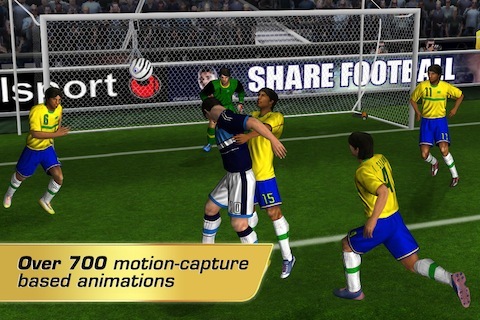 Gameloft’s Real Soccer 2012 is here in the App Store. Play your favorite FIFPRO players with this iPad, iPod Touch and iPhone optimized application. In Real Soccer (Football) 2012, you have many modes to choose from and the graphics are pretty good although gameplay suffers from a few different issues. The concept for this app is very straightforward: you are playing in football tournaments to be the best team in the world. There are many different app modes and tournaments you can enter in the “International Cup” modes. You also get to manage your team as you take it to the top with “League” or you can just play a simple app against other teams with “Exhibition.” There is also a training mode for people who haven’t played many sports apps in the past. When it comes to audio, this app is a little lacking. There are plenty of sound effects for kicking and passing the ball, running on the grass, tackling opponents and whistle blows during a penalty or goal. However, that’s it. There’s no music between the sound effects, which can sometimes make long rounds seem a little empty. However, if you are engrossed enough, you may not even notice this. For something on the iOS device, Real Soccer 2012 has rather impressive graphics. This is especially true when the camera is far away, such as when the ball is on the field and you are trying to score goals. However, sometimes the camera zooms in on scoring players, people passing on the sideline or the goalie. When this happens, you will notice some graphical problems. The faces look a little flat, and the ball will pass through people’s hands. Since the app is rarely zoomed in you shouldn’t notice this too much, but people who get really distracted by graphical errors, this could be a problem. For a sports app, the controls here are rather basic. You get a D-pad on the left and three buttons on the right that let you kick, tackle and pass the ball. The controls are very simple to learn, so even if this is your first sports app you shouldn’t have any trouble picking it up. Unfortunately, there are a few problems that really hold this app back, and it’s not just the graphics or lack of music. There is no multiplayer support, either on the same device or over the Internet. Adding this could have made the app much more fun, but you are stuck playing by yourself. Another problem is how payment for this app is structured. The app itself is free, but to make your league better and get unlockables, you have to spend actual money via in-app purchases. There are a lot of apps like this, and if the packages are cheap this generally isn’t a problem. In Real Soccer 2012 there are some packages that are just $1, but then there are others that cost nearly $100. 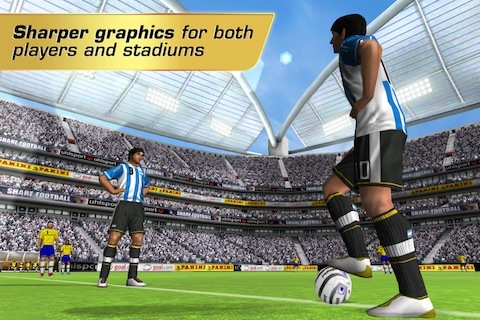 If you want to play a fun soccer game, then Real Soccer 2012 can definitely give you that experience. The controls are good, and the graphic are above average, plus the game is free to download and works on both iPad and iPhone. However, no multiplayer support and a plethora of hidden in-app purchase options hold this game back from getting a higher rating. 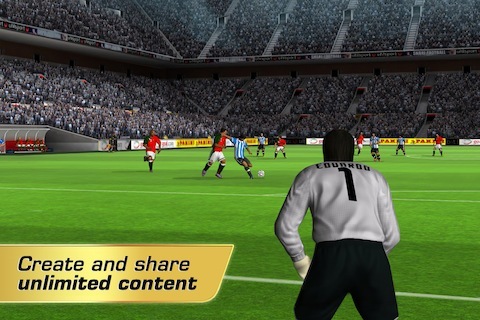 AppSafari review of Real Soccer 2012 was written by Joe Seifi on December 19th, 2011 and categorized under App Store, Featured, Fun, Games, iPad apps, Sports, Universal. Page viewed 7282 times, 2 so far today. Need help on using these apps? Please read the Help Page. i want to play Real Soccer 2012 right now but i can’t because it says i need 16 stamina when i have 34 of those. Please fix.